The term epicyclic comes from the path of a point on a planet gear which traces out an epicycloid in space. Therefore, there are three elements in the differential. Epicyclic differential can be simple differential, compound differential or planetary differential. 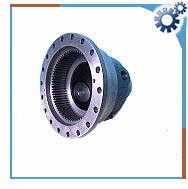 Simple epicyclic differential - consists of a central external gear meshed with one or more external gear. The planet gears are meshed with an internal gear that encloses the system. The planet gears and the planet gear support bearings are held in a carrier which rotates about the geometric center of the unit. The ring gear ratio ranges between 2:1 to 11:1. Compound epicyclic differential - consists of a central external gear meshed with one or more external gears. The sun planet gears are part of two-gear cluster on the same shaft or axis. The second gear is the ring planet gear, which are meshed with an internal gear that encloses the system. The ring gear ratio ranges between 5:1 to 24:1. Planetary epicyclic differential - a compact differential consisting of three elements that are mechanically connected by the sun and planet gears. The combination of motion solves many electro-mechanical problems. Epicyclic differential offer high torque capacity and a wide range of reduction ratios in a compact space. Typical applications of these differentials include reducers, phase shifting, timing movements, balance speed and torque, creation of relative speed while running, and precise speed adjustment.